I've been a reading machine lately.. which isn't abnormal for me this time of year. I finally got around to checking out Bossypants and am looooooooving it. I had completely underestimated its reported hilariousness. now I get it. I so get it. I've started to dabble into The Message after hearing so many inspiring words over the past couple of months. I have to say I am really liking what I have read so far and look forward to discovering more of it. 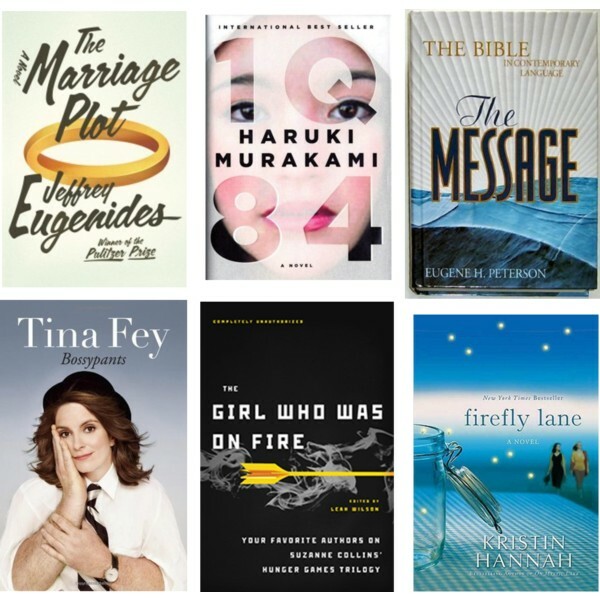 The Marriage Plot and 1Q84 have been on my list since the start of the year-- as new works from some of my favorite all-time authors; I can not wait to dive into those. As well as this awesome Hunger Games collaborative work that my sister gave me for Christmas and Firefly Lane, another novel that I have been waiting to get my hands on for months. good books makes for a happy winter. what's on your list?